Aerobility's Tecnam and Piper Warrior in their natural home. 2018 sees our 25th anniversary and what a journey it's been so far! From humble beginnings back in 1993 to our current fleet of 5 aircraft with a head office at Blackbushe, the addition of a dedicated classroom and shop last year, our building a plane project, disabled flying facilities now operating from Tatenhill and in the Liverpool area as well as Blackbushe. Nearly 1000 disabled people per year are participating with Aerobility. what else can I do?" 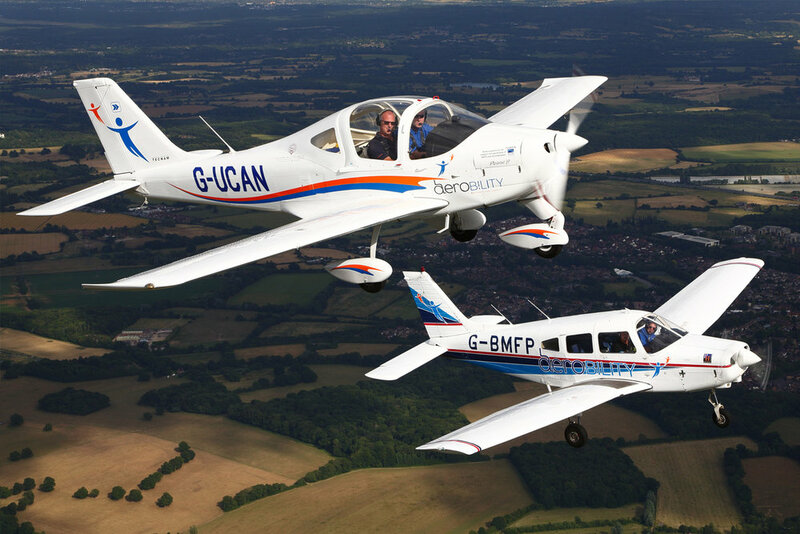 Aerobility provides 'experience of a lifetime' trial flying lessons for as many terminally ill and disabled people as possible every year, also subsidised flying days for other disability charities and at-cost instruction and qualification flight training to disabled people. A User Led Organisation ("ULO"), Aerobility is run largely by disabled aviators, for disabled people. Through various fundraising initiatives and careful management strategies we allow disabled people to fly for a fraction of the commercial rate. Despite our professional appearance, and the astonishing outcomes that we produce, we are critically short of funding. We rely on donations, in cash and kind. These come from a small number of commercial organisations and charitable trusts, together with one-off and regular donations from supporters, and the annual Aviators Ball fundraiser. We do so much more, with so much less - literally stretching every penny into the sky for our charity - but find that demand always outstrips what we can supply. Constantly looking to further improve what we offer, it is our ambition to grow into a better, as well as bigger organisation - and we need the funds to make it possible.